This Little Portugal semi used to be chopped up into poky, purple-and-green-painted flats when purchased in 2015. Now, the rooms are well proportioned and the details delight. Few things are more satisfying than an artful facsimile – a convincing, affordable stand-in for something otherwise expensive and luxurious. The semi of husband and wife Joel Barkin, a contractor, and Sarah Phillips, who works in advertising, achieves exactly that several times over. 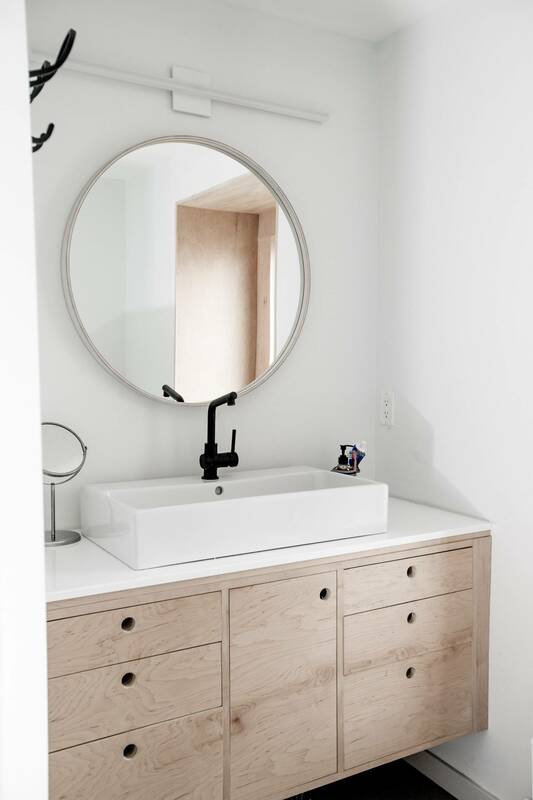 The kitchen and bathroom cabinetry could be mistaken for custom but are mostly from IKEA, and the floors look like wide oak boards but are actually planks of sanded plywood. Over all, their place, which was chopped up into poky, purple-and-green-painted flats when they bought it in 2015, now has the aspirational quality of a Dwell-worthy dream home in Toronto's Little Portugal neighbourhood. Beautifully proportioned rooms flow from one to the other. The details delight, such as the wood-covered, warm walls. But it wasn't a serious strain on their wallets. A little sweat-equity from the owners and flexibility on materials meant costs came in under $200 a square foot – well below what similar renovations might cost. To achieve their aesthetic, Sarah and Joel not only did a lot of the construction themselves (Joel's professional background helped a lot), they also worked with emerging architecture firm Studio AC, whose co-founder, Jennifer Kudlats, has been a long-time friend. "I've known them both since we were kids," Ms. Kudlats says, "but I won't take credit for introducing them." Having Sarah and Joel's hand in the project was instrumental to its successful execution, says Andrew Hill, Ms. Kudlats's partner. "This project has a level of clarity and sophistication because they worked on the project themselves," he says. "It's rare and special to work with homeowners that are building their own house," Ms. Kudlats adds. "It meant that we could problem solve together. We knew that we wanted to be cost effective, but elevate the design. To achieve that dance, we worked back and forth and tried new things." Lots of white and beige dominate the renovation. ‘At a certain point, this project became about how we can really celebrate plywood,’ says Jennifer Kudlats of Studio AC. The floors are one of the most notable experiments. Joel explains that they didn't want conventional hardwood. "We have a dog, the floors would be destroyed," he says. So they bought hardy plywood sheets and ripped them into strips. "We figured, even if it doesn't work, at least you only spent 30 cents per square foot," Ms. Kudlats says. Conventional hardwood often costs 20 times that or more. Other aspects of the house were more sure-fire. "The main design element," according to Mr. Hill, "is that the stairs, kitchen, storage and entry are all encapsulated in one element, which acts like the biggest piece of furniture in the house." 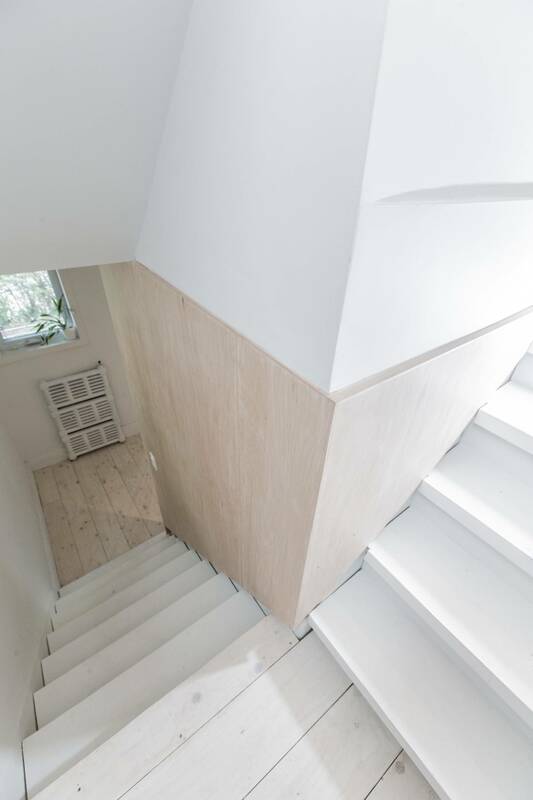 Plywood wraps around the home, leading up the stairs to the second storey. Walking in the front door, that element at first appears as the front-hall closet, clad, fittingly in plywood. "At a certain point," Ms. Kudlats says, "this project became about how we can really celebrate plywood." The plywood, though, wraps around, on one side leading up the stairs to the second storey where they have a secluded, serenely white master suite, and on the other side into the living room, where a long, graphic shelf carries the eye down and around into the kitchen beyond. "It's a very common within our work," Mr. Hill says, "to have highly functional elements that also visually elongate the space." The kitchen and bathroom cabinetry could be mistaken for custom but are mostly from IKEA. Organizing the most utilitarian elements of the home into a single, compact zone helped free up the living and dining room to be airy, flexible, and free of bulk such as closets and coat racks. "When you are designing minimal spaces like this, having artful storage is very critical," Mr. Hill says. "You have to make sure that it doesn't just look good in the photographs, but that it works." That said, both Joel and Sarah hesitated about the blocky insertion. "At one point during construction, this whole space was completely open," Joel says. "Then I went to frame this in, and I had a moment of utter panic: 'Oh my god, what are we doing?'" "I work in advertising," Sarah says, "and I'm used to being that person on the end of the client relationship saying trust us, we know what we're doing. But these guys didn't just say trust us, they spent a good two hours here showing what we could possibly do if we were feeling that panic. And by going through that exercise, it helped us realize we were actually on the right track." "In the end, it's such a great little space that I can't imagine the alternative," Joel says. The home's master suite is secluded and serenely white. Plus, the central element isn't entirely workaday – it has a key element of whimsy. Poking out of the back of the kitchen cabinetry, into the living area, is a peaked-roof house for Joel and Sarah's dog, Rusty. "When Joel and Sarah gave us the brief for their place," Mr. Hill says, "they said they needed a corner to throw a dog bed. I looked at that, and thought we can do something special here." Mr. Hill and Ms. Kudlats inserted the structure – which has the stripped down form of a Scandinavian farmhouse, a key inspiration for the overall project – into a corner of the cabinetry that would otherwise be too deep and awkward to truly be useful. According to Ms. Kudlats, the doghouse represents "a stream of thought in our work where we try to have that element of delight. It's iconic, but also seriously cute." And, like many other gestures in the space, it adds tremendous value in spite of its modesty.